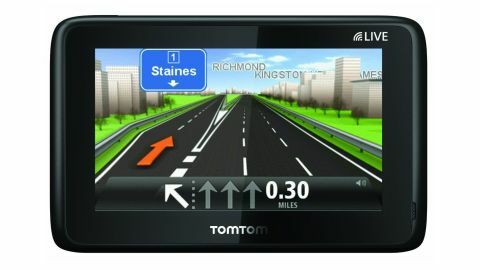 Is TomTom's new high-end sat nav good enough to lead the line? Can the TomTom Go Live 1000 match up to the best sat nav from Garmin? The sat nav market is becoming a very crowded place, and the quality of hardware has rocketed in the last year. Gone are the poor quality boxes with screens like Casio calculators. The market is now awash with internet-connected iPhone-like creatures, with decent processing and a host of options. The TomTom GO LIVE 1000 is the newest entry into the TomTom range, and sits at the top of its hierarchy of sat navs, trumped only by its larger brother, the TomTom GO LIVE 1050. However, it stands in direct competition with the excellent Garmin Nuvi 3790T and the 3760T for the sat-nav crown. Like the Nuvi 3790T, the TomTom GO LIVE 1000 is a sleek, solid-feeling device, and the difference between earlier models is clear from the offset. The sluggish resistive touch is gone, and TomTom has given the GO LIVE 1000 a solid capacitive screen. It feels like an iPhone, and it's more responsive to the finger than the TomTomGO 950 and easier on the eye as well. While TomTom has led the march on sat nav technology for much of the last three years, in the GO LIVE 1000 has fallen behind somewhat. The 4.3-inch screen has a resolution of 480 x 272 and looks bright and vibrant, but is trumped by the impressive Nuvi 3790T's 800 x 480 offering. What's more, at 218g, it weighs nearly twice as much, making it significantly more cumbersome to carry around. TomTom has improved its bracket for attaching to your windscreen, and made it smaller, lighter and easier to use. It has the ability to fold away neatly, and has a magnetic attachment to hold the unit in place, which makes it easy to whip it out one-handed and replace without fiddling. The suction unit uses the same twist principle as older models, but it's now smaller and easier to apply.